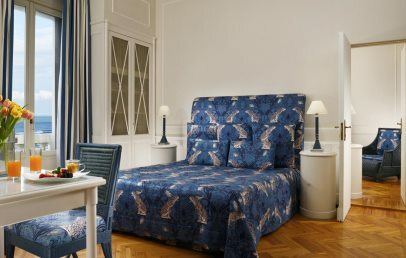 This prestigious hotel is located on the seaside town of Viareggio, advantageously situated on the seafront and close to all the amenities such as boutiques, specialty shops, restaurants and nightclubs, a pine forest and the railway station. The Grand Hotel Principe di Piemonte is located at only 30 km from Pisa airport and 2 km from the exit of Viareggio motorway A11-A12. Florence is 80 km far away. 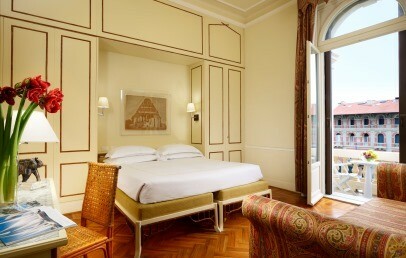 The Grand Hotel Principe di Piemonte is a notable hotel built around the 20s. Over the time it became the favourite residence for members of the aristocracy, intellectuals and artists as well as scenery for various film productions. In 2004, after a long renovation, the hotel has returned to a prime property, the most elegant and refined historic hotels in the international scene. Today has earned the honour of being a member of the Small Luxury Hotels of the World, which includes many prestigious hotels around the world. This hotel is spread over five floors, each of which has been decorated in a different style (international, deco, colonial, empire and modern) as if to emphasize the changes that the hospitality has had during the different ages. On the top floor, there is the culmination of colour and brightness: a heated pool and whirlpool with three waterfalls, which offers a splendid view. Undoubtedly one of the best things that the Prince of Piemonte has to offer. 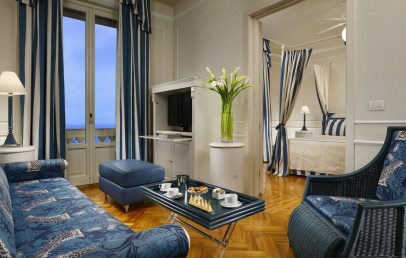 The 106 rooms are divided in double rooms and suites, are spread over five floors from where you can enjoy a view that sweeps from the sea to the Apuan Alps. The rooms, mostly decorated with a canopy bed respecting the style featured in each floor, are elegant and comfortable with prestigious marble bathrooms with shower and/or bath and are equipped with all the most advanced technological equipment: high-speed internet connection, LCD televisions with satellite channels from around the world, pillow menu. The long beach of Viareggio is located a short walk from the hotel, with several bathing establishments. At the same time of the booking of your room, you can also book the beach service with umbrella and sun beds to special conditions. The spa at the Grand Hotel Principe di Piemonte is spread over 350 sqm where guests can choose among various treatments for body and mind: water games, sauna, fitness centre, special massages, Turkish bath with Kneipp path, showers with aroma- and colour-therapy, beauty treatments for face and body. A relaxing experience in a warm and professional setting. The entrance is complimentary with the use of the turkish bath, sauna, chromotherapy showers and Kneipp pools. The treatments and massages are upon reservation and at extra cost. At the gourmet restaurant "Il Piccolo Principe" with 2 Michelin stars, you can taste the excellent cuisine of the Chef Giuseppe Mancino, pluri awarded, very refined and mainly based on fish. These delicacies are prepared with the best fresh fish and meat, everything accompanied by an excellent selection of national and international wines. The restaurant is open for dinner from May to October and does welcome guests who are not staying at the hotel. Moreover, on the ground floor, is the restaurant "Regina" with an indoor and a veranda, overlooking the promenade and offering a traditional Tuscan cuisine, open every day for lunch and dinner. At the Grand Hotel Principe di Piemonte it is possible to organize any type of event thanks to the seven meeting rooms with a maximum capacity of 250 people. The internet connection Wi-Fi is available free of charge in the entire hotel. The hotel has a private parking place (starting from € 20,00 per day, on request). From 30.9. to 15.6. the hotel is a 4 star hotel, because of a reduction of offered services. The city tax is from January 1st to June 14th: 2,00 € per person, per overnight; from June 15h to September 15th: 5,00 € per person, per overnight; from September 16th to December 31st: 2,00 € per person, per overnight. To be paid on-site. Distributed from the first to the fourth floor. This elegant double rooms with Front Sea View are furnished in different styles and have a beautiful sea view. They have a double bed or two single beds with a bathroom covered in marble and large balcony or balustrade overlooking the sea. The rooms are located on all floors on the back side of the hotel. They have an elegant master bedroom with a marble-clad bathroom with bath and/or shower. The Suites are a good solution for families, they are furnished in an international way, art deco, colonial and empire style and offer a breathtaking view of on the sea (frontal or side sea view). The suites consist of a bedroom with a large marble-clad bathroom with tub and shower and a spacious living room (most of the suites are communicating with another master bedroom). They can accommodate up to 4 people. 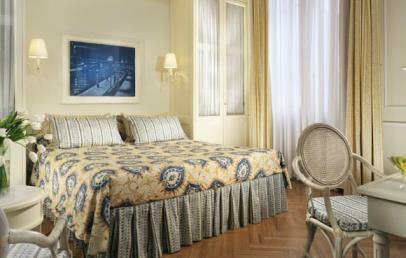 The rooms with Side Sea View are located on all floors except the fifth and overlook the famous Piazza Giacomo Puccini. They have a double bedroom with bathroom covered in marble with tub and/or shower and a large balcony (except on the 4th floor). The Family rooms consists of 2 interconnecting Superior rooms with sea view, each room with its own bath and with 2 single beds of 190x90 cm, that can be set into a comfortable double bed. 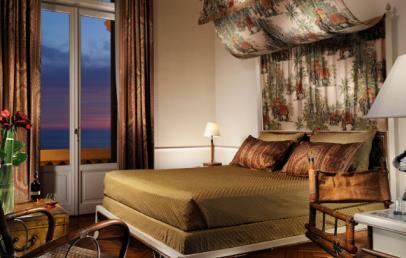 The view goes out to the famous promenade of Viareggio and on the sea. Each bathroom has either a tub or a shower, hairdryer, soft towels, bathrobes, slippers, make-up mirror, courtesy set. 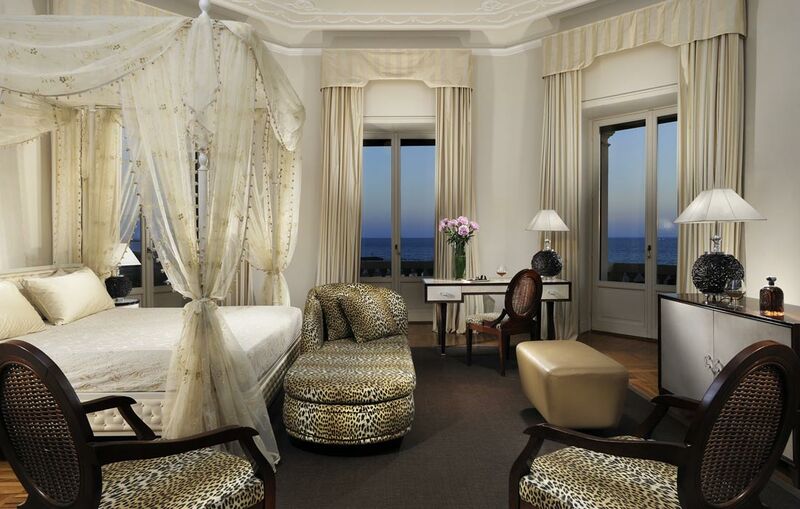 The Junior Suite sea view with balcony, renewed in terms of structure and furnishings, has a fantastic view over the sea thanks to its privileged location on the third floor of the hotel and to the spacious balcony with table and chairs, accessible from the large window doors. The decor is in Colonial style with parquet floors and marble. The very spacious bathroom has a tub, large separate shower, hairdryer, bathrobes, slippers, makeup mirror, complimentary toiletries and soft towels. 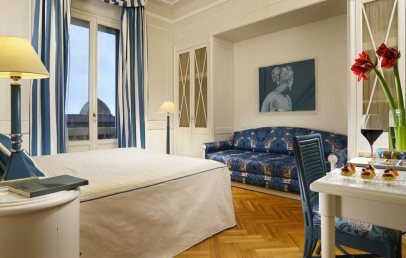 The Deluxe rooms with a side sea view face directly Piazza Giacomo Puccini, one of the most beautiful squares in the city and offer a picturesque sea view thanks to their panoramic position. It has two single beds, possibility to combine into a double bed (190x180) upon request. Moreover the Deluxe room has a sofa bed for a third person. 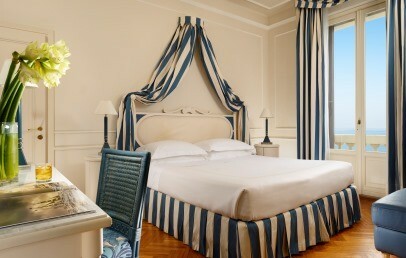 They are located on the Empire style floor, with parquet floor and marble in the bathroom. The bathroom has tub or shower, hairdryer, soft towels, bathrobes, slippers, make-up mirror, courtesy set. The access to the SPA is included in the price!